It’s nearly that time of year for christmas lights, hot cocoa, and carolers in the yard, but with all the pleasantries of the season it’s important to be mindful of safety for your home and family. It’s a widely known fact among emergency response professionals that the winter holiday brings with it the highest number of preventable fire hazards. So what can you do to keep your home safe? Every year Thanksgiving day is the number one day for residential cooking fires. In fact, kitchen fires are 4 times more likely to occur on Thanksgiving than any other day out of the year. This is followed closely by the day before Thanksgiving, and Christmas day respectively. There is even a statistically high number of kitchen fires involving holiday decorations that were kept too close to kitchen appliances. When you’re preparing your holiday meals, don’t leave anything on the stove or in the oven left unattended. Keep holiday decorations in the kitchen to a minimum, and always make sure you have a reliable fire extinguisher where everyone can reach it. Many people like to use scented candles during the holidays to make their home look and smell more festive. 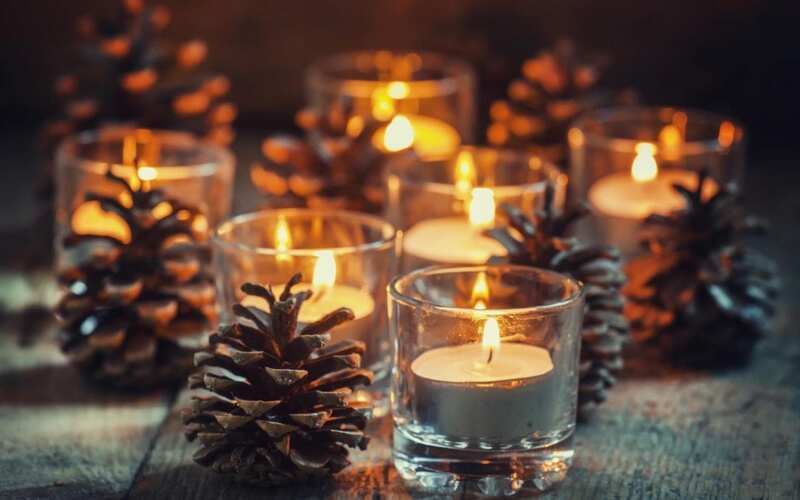 Although they can be a staple of the holidays, candles are responsible for more than one-third of home decoration structure fires. Falling asleep with a lit candle in the house was the cause of 11% of home candle fires, and 21% of related deaths. Never leave a candle lit if you’re not home, or planning to fall asleep. Even if you’re uncertain about whether or not you can keep an eye on the candle, just be safe and put it out, it’s not worth the risk. Also be sure that candles are far away from curtains or hanging decorations. For many Americans, it just isn’t the holiday season without a Christmas Tree, but over the last few years, there were an average of 200 residential fires per year caused by them. What’s more, faulty or frayed tree lights were the cause of the fire in 2 out of 5 cases. Always make sure you select a christmas tree with fresh green needles that don’t fall off when touched. Keep the tree watered, keep it away from heat sources or open flames, and never let it block any exits. Inspect Christmas tree lights carefully to ensure that they are not damaged or faulty. It could also be a good idea to have your lights on a timer or smart switch so they are not on all the time. In all of these cases it’s crucially important that your home is equipped with proper smoke detectors as well as carbon monoxide detection. Making sure that detectors are placed strategically in your home will guarantee fast response in the event of a fire, regardless of the cause. These days there are many smart detectors on the market that can alert your phone or tablet in the event of a fire no matter where you are. So be sure you protect your home this holiday season, and Happy Holidays. Contact us at 805-880-1200 for a free estimate on upgrading your home’s fire protection!